If you find that Christmas can be a little stressful at times why not take a break and find your happy ho-ho's again? 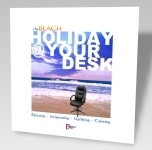 The Beach HOLIDAY@YOUR DESK audio visualizations can take you into waves of soothing wonderful in just a few minutes, and all you have to do is stop, listen, and allow yourself to go along for the swim... uh, I mean the ride. Enjoy. Judy's grief journals have been offering support to those suffering the loss of a loved one for some time now. If you know someone experiencing grief this Christmas, perhaps Judy's words will help.